Recently I was privileged to experience two closely related yet separate organisations that are opening up new opportunities to advance the field of anti-submarine warfare. They were the NATO Centre for Maritime Research and Experimentation in La Spezia, Italy, and the Elbit Systems facility in Haifa where they are developing and trialling the SEAGULL unmanned surface vessel (USV). Both of these organisations are pursuing some fascinating technologies that will enable surface ships to better exploit the underwater environment. The threat from the modern SSK remains unchanged, and as they make little or no noise the use of passive sonar to detect and track them has long been discounted as an option. Speed remains a constraint, and despite the revolution in air independent propulsion systems they are still limited in their ability to operate at high speed for extended durations or operate at long range for long periods, problems that nuclear-powered submarines do not have. Barring some esoteric non-acoustic technological revolution, it is clear that the way forwards is to use active sonar technology, to saturate the underwater environment and get a hard fix on a submarine’s position. This is difficult to achieve from a surface ship in many areas of the world, as the acoustic conditions generate layers that trap hull mounted sonar energy and offer protection for submarines to hide beneath. Moreover, these conditions can limit sonar range so a surface ship alone has to work harder to cover an area of sea surface. Modern variable depth sonars offer a good counter, but one ship can only search so far – you need multiple sonars to search a meaningful area, if you are to evade the submarine and stay safe. Helicopters are also excellent ASW assets, combining dipping sonars and sonobuoys, but they are equally limited by range and endurance – even the mighty Merlin can only operate for 3-4 hours at a time before it needs to refuel. Maritime Patrol Aircraft are the most effective asset we have, but they also have their limitations – location of a fixed base to operate from, range, fuel, numbers of sonobuoys, etc. All of these are important layers in the ASW battlespace, but it would be good to exploit our technologies to better effect as we are doing in the above-water space with radars, such as cooperative engagement capabilities. The area of technological advance we should focus on is active multistatic sonar, the ability to use multiple transmitters and receivers to saturate an area and examine contacts and detections from multiple angles and at multiple depths. We also need better capabilities that enable us to properly understand the underwater environment – if you do not have accurate and up-to-date temperature and salinity information, you are already several steps behind the submariner who lives in that environment and knows how to exploit it. A submarine constantly measures the sound speed profile, and knows exactly at what depth to hide and at what depth to gather sonar information, so they already have the advantage. The challenge is achieving that from surface ships. A good variable depth sonar will give you this information, as will expendable bathy-thermographs (XBTs) dropped by surface ships and aircraft which will add to existing models of sonar conditions. But these are point measurements, not constant evaluations. What would be best is if we had our own submarine operating ahead of the force giving us constant temperature and sound velocity measurements – which is where CMRE is going (video here). By developing and militarising a suite of autonomous underwater sensors, we gain a huge leap forwards in understanding the underwater battlespace and therefore can more rapidly understand where a submarine is likely to be operating, especially in congested, noisy or challenging waters such as the Gulf or Eastern Mediterranean. The challenge then becomes the ability to network that information across ships of a force in ways that go beyond simply sending the measurements, instead driving common advanced acoustic models that factor in different sonar performance and capabilities to optimise the search – data exchange is the key. This is also part of CMRE’s work, and is the area that will yield the greatest reward. Better understanding is one aspect, but we still need to widen our ability to search larger areas when the sonar conditions constrain our detection ranges. Accordingly, we need more sensors, more point sources and the ability to process that information centrally – this is the principle of active multistatics. We could employ more ships, more aircraft and more buoys, but this is an expensive way of doing business. The key to putting more sonars ahead of the force on a longer-endurance basis is the unmanned surface vessel, of which the SEAGULL is an excellent example. Effectively a large powerboat with a 4 day endurance, the SEAGULL has a number of options. With small moon-pools inside the craft, hull-mounted sonars and sound velocity probes can be fitted quickly and the design can be optimised for either MCM or ASW. A remote gantry on the aft end allows for the deployment and recovery of towed sonar systems, such as sidescan sonars for MCM or variable depth sonars for ASW. Elbit are offering what is basically a helicopter dipping sonar, installed in one of the moon pools, but the real advance would be their integration of the GeoSpectrum Technologies TRAPS variable depth sonar. This system, which offers a separate transmitter and receiver array, will have the ability to not only detect it’s own transmissions but those of other sonars as well. It can operate on satellite or line-of-sight radio, and can carry a radar that can be optimised for periscope detection. Thus the system offers the ability to function effectively as a node in a multi-static ASW network – the challenge remains the integration of other sonars and point sources to produce a full-spectrum analysis of the environment and localisation of a submarine. These small, compact and relatively low-cost systems offer a potential doubling or tripling of a surface ship’s detection capability, depending on how many USVs are deployed, and are worthwhile options to be installed in a large warship’s mission bay. Small vessels such as these could be considered vulnerable to attack from the air or surface, but they could easily be made low-signature, camouflaged or otherwise made difficult to locate – we should take some lessons from drug runners in the Caribbean who do exactly that. So, a vision of near-future ASW could look like this. Ahead of operations in a particular area, a number of autonomous underwater sensors are deployed, mapping the environment and generating an updated model of the sonar conditions that exist. A force then moves into the area, screened by a number of USV’s deployed ahead of the force. The escorts could search a huge front, with the USV’s up threat and able to detect the SM before it can get into firing position and MPAs, if available, would link into the network and add their own sonobuoy data. Once detected, the SM is fixed and the force can deal with it however it wishes – surging helicopters or MPAs to harry the SM, or long-ranged engagements with a weapon such as ASROC. It’s a worthwhile vision of how effective a Type 31 frigate could be if both it and two SEAGULLs were equipped with an interlinked system like TRAPS and a weapon such as ASROC. The greatest challenge of all of this is bringing the ability to integrate the data, the active acoustic technology, to all surface ships. All sonars can be used to transmit and receive energy, but it needs an underwater equivalent of Cooperative Engagement Capability (CEC) to process the returns and analyse where the submarine is located. 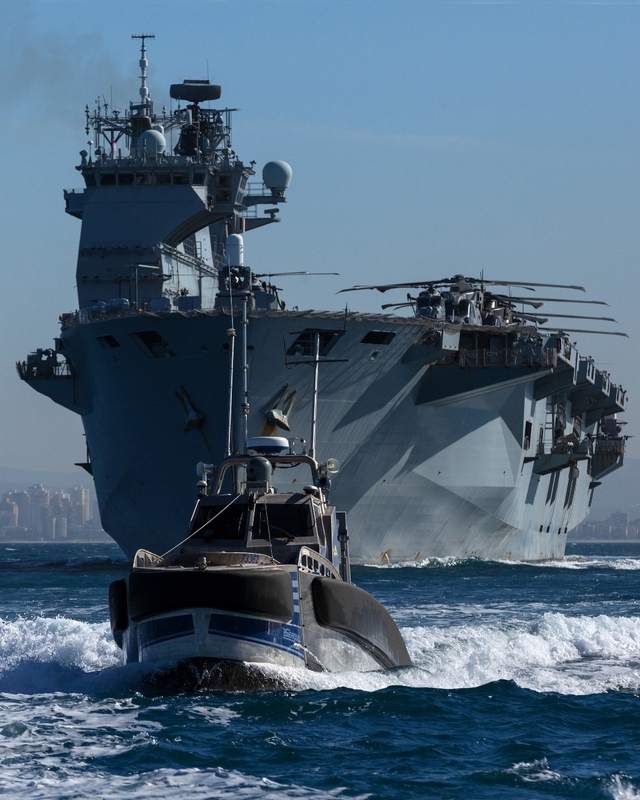 This is why CMRE’s involvement is so important – they can drive the NATO standardisation process, developing the models and the processors that would allow all ships of the Alliance to contribute and function effectively. It is also an example of where autonomous or unmanned systems can add real value to maritime warfare, and is an area that deserves full consideration. Very interesting, thank you verdigris. You’re absolutely right that unmanned underwater and surface vessels get round some of the endurance issues associated with aircraft, whether fixed or rotary winged, and still allow one to keep surface vessels at range. CMRE is part of defining terms and and setting the rules for interoperability, and will indeed be hosting a symposium on the subject in Lisbon in October. Not all of their products are high quality though and overall I get a sense that NATO could usefully do more thinking on the subject. I just came across this article https://navy-matters.blogspot.com/2018/10/a-vision-of-future-asw.html that quotes and takes a alternative view to this article.